The United States is bent on pulling the plug on China's ascent since the world's only superpower can't tolerate China's peaceful resurgence. But President Donald Trump's tariffs on foreign goods do not only affect exporting countries such as China and Germany, they also undermine the entire global economy. This is why the rest of the world must move closer together to defend free trade against an unpredictable U.S. leader. 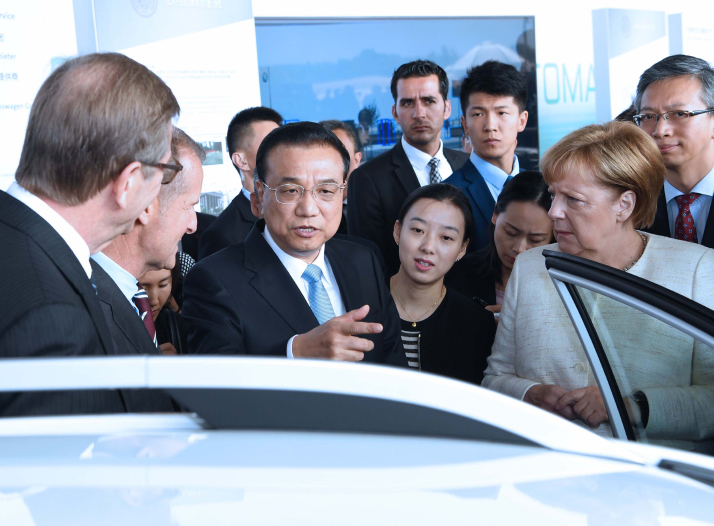 Chinese Premier Li Keqiang visited Germany in early July for the fifth China-Germany government consultations, meeting with German Chancellor Angela Merkel and signing several joint treaties. The most important topic during these consultations was the United States' trade frictions with other major world economies including China and Germany. Both the Chinese and German economies are strong export-oriented success models, and are among the world's strongest economies in terms of GDP as well as several other areas. Trade tensions between the United States and China—the two largest economies in the world—have intensified since the United States imposed a 25-percent additional duty on Chinese products worth $34 billion on July 6. China's response didn't take long to arrive. Chinese customs authorities immediately announced that additional duties on the same amount would go into effect on the same day for certain imports from the United States, including agricultural products, marine products, vehicles and vehicle parts. Trump has repeatedly described China's economic practices in international trade, particularly China's trade surplus with the United States, as unfair. According to Trump, its trade surplus with the United States was allegedly $375 billion in 2017, a figure rejected by the Chinese side as inaccurate. As with China, the United States under Trump began an attack on Germany due to its strong export economy. In particular, the automotive industry—a key German sector—has been feeling the effects thus far. Trump has also attacked the German Government on the international stage for its insufficient defense spending and contributions to the NATO defense alliance. In addition, U.S. Ambassador to Germany Richard Grenell demanded that German companies stop doing business with Iran and recently drew the ire of many people when he stated that he intends to support conservative governments in Europe in the future, a statement unheard of for a diplomat. But it seems that all of Trump's attacks and punitive measures have backfired once again. During the consultations in Berlin, several agreements were signed which will further intensify economic and industrial cooperation between China and Germany. Among the most important new cooperation projects are a plan between Siemens and Alibaba and the construction of a large automotive battery factory by China's Contemporary Amperex Technology Ltd. in Germany. In addition, China continues its opening up at an accelerated pace as planned. Meanwhile, the Trump administration has announced further tariffs against China, this time on goods worth an incredible $200 billion. Furthermore, Trump has made it clear that he wants the conflict to escalate with a tweet a few weeks ago that read, "Trade wars are good, and easy to win." He is very wrong about that. On the one hand, it would be dishonest to accuse Trump of being wrong about everything he has said. The imbalance he deplores in international trade does exist, and European Union (EU) and Chinese tariffs on U.S. goods have not been fair in all areas. China, as a developing country, can be forgiven in this regard, but in the case of the EU it is very disappointing. On the other hand, both China and the EU have shown willingness to negotiate with the United States. However, Trump's unreliable and aggressive approach has so far nipped almost all possible agreements in the bud. Is Trump even interested in more balanced international trade, or is he just pretending to be? In any case, there is no improvement in sight. Trump is not a real politician, and he is certainly not a diplomat. The real problem with him, however, is that he also does not seem to be an honest businessman. Even if the handshake principle may no longer generally apply today, with Trump, there is no guarantee that he will abide by written agreements and contracts. Former German Foreign Minister Sigmar Gabriel recently warned against showing any weakness in dealing with Trump. In an interview with the German magazine Der Spiegel, Gabriel said the United States can't be relied upon under Trump since he only knows power. "We can't work with Trump and we can't work without the United States. We therefore need a dual strategy: clear, tough and, above all, common European responses to Trump because any attempts to accommodate him, any currying of favor, will only lead him to go one step further. This must stop." Just a few months ago, Tesla car dealers in China had every reason to be pleased. The trade dispute between China and the United States had not yet heated up but had led to China initially reducing its taxes significantly on Tesla's electric cars. Tesla and its dealers reduced prices on their Chinese vehicles and the number of pre-orders immediately skyrocketed. In the meantime, however, the wind turned and due to the punitive tariffs imposed by the United States and China's forced response, the prices for all foreign vehicles—including Tesla and various German manufacturers that import some of their top models from plants in the United States to China—have shot up significantly again. Currently, there is talk of prices increasing by 40 percent. But even in this area, Trump's efforts to hurt China may backfire since Tesla, in view of current developments, has significantly accelerated its plan to build a huge gigafactory in Shanghai in order to continue to guarantee its Chinese customers good prices. In addition, BMW has started production in China of its X3 SUVs, which were previously exported from its plants in the United States. This process is now more likely to be seen at BMW as well as other car manufacturers. Trump's measures may slow world trade, cost a whole lot of money and require some manufacturers to transform their global supply and value chains. He will likely lead his own country into isolation. But that's it. Trump cannot prevent the big changes that have already begun. The United States is struggling and has long recognized that one day in the not-too-distant future, it will no longer be the only superpower on earth, but will have to share the spot with several great powers. It is precisely this circumstance that currently makes the country dangerous, even to its most traditional partners, especially under someone like Trump, who seems bent on defending the U.S. position with his America First doctrine at all costs. Under Trump, the United States seems to have transformed itself into an injured predator that will mercilessly attack anyone who approaches it. In contrast to Trump's strategy, the Belt and Road Initiative proposed by Chinese President Xi Jinping promotes the construction of a modern land and water Silk Road. It offers many opportunities to serve all humanity, to help countries on all continents to participate in the growth of the world economy and to maintain and learn new technologies that will enable progressive, sustainable growth alongside nature instead of against it. If Trump is determined to lead his country into isolation in the face of these diverse opportunities, he should simply be allowed to do so. The spirit of a multipolar world order has long since escaped from the bottle and even the most quarrelsome characters like Trump will not be able to get it back in. China and Germany should further intensify their cooperation at all levels and jointly promote the construction of new Silk routes. Along these old and new trade routes there are more than enough business and development opportunities from which all parties can benefit. Trade should be as balanced as possible, without gigantic trade surpluses, as should the consultations, conciliation procedures and mediations in the event of disputes between the countries involved, which are always advocated by China. Perhaps a free trade area covering all the trade routes of the Silk Roads would be the key basis for further, appropriate growth of the world economy, more sustainable development, and the fight against poverty. This would be the best answer to Trump's isolationist policies and America First rhetoric. It would involve no threats, blackmail, aggression, military intervention or hysterical Twitter messages, as well as no punitive tariffs.